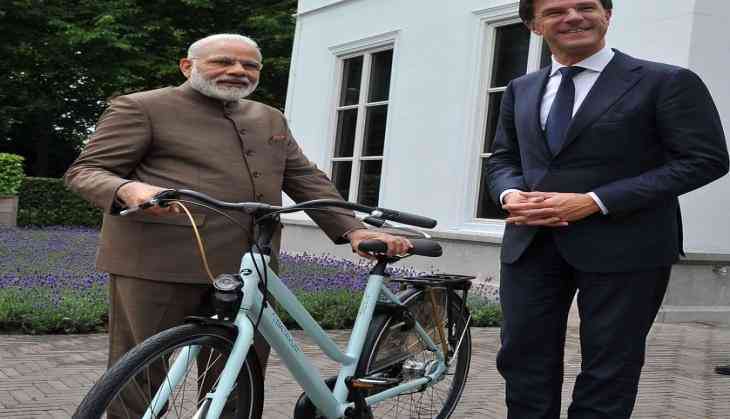 Dutch Prime Minister Mark Rutte has gifted a bicycle to Indian Prime Minister Narendra Modi during the latter's day-long visit to The Netherlands on Tuesday. A picture shared by PM Modi on twitter, shows him smiling and riding a bicycle which was gifted to him by his Dutch counterpart. PM Rutte with a big smile on his face was also seen standing besides PM Modi when he was riding the bicycle. PM Rutte usually comes to work riding a bicycle as cycling is considered to be the most preferred mode of transportation in The Netherlands. PM Modi arrived home on Wednesday following a successful three-nation tour to Portugal, US and the Netherlands.